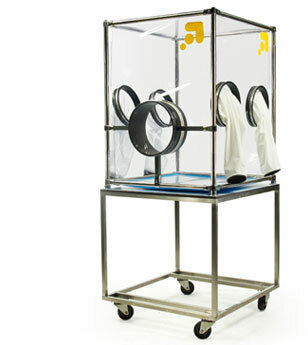 The Arrowmight Transfer Isolator is designed to be connected to the Arrowmight range of Flexible Film Isolators. The Transfer Isolator provides additional storage, and can be used as a disinfection unit. The Transfer Isolator can also be used for transferring equipment or materials between Isolators and around the laboratory. Canopy manufactured from 0.50 – 0.75 thick pressed polished optical quality anti static clear PVC. Two 300mm clamp-type polypropylene sleeve ports are fitted to the front and back of the canopy. Round PVC Transfer Port at each end.